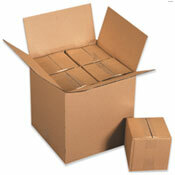 We feature a wide array of box sizes and styles to suit your packaging requirements. 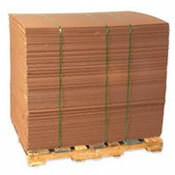 Corrugated cartons are used to protect a wide variety of products during shipping and storage. It is important to choose the right strength. Generally speaking, 32 ECT (Edge Crush Test) cartons are acceptable for most contents, up to 65 lbs., and 44 ECT cartons are acceptable for up to 95 lbs. To choose the appropriate carton size, measure the size of the item you want to pack, and then calculate extra space on each side of the item, so that cushioning materials, if needed, may be added to protect the contents from damage. Dimensions are given in the sequence of length, width and depth. Internationally, the words length, breadth and height may be used to express these dimensions. The dimensions of a box are described based on the opening of an assembled box, which can be located on the top or the side, depending on how it is to be filled. The opening of a box is a rectangle; that is, it has two sets of parallel sides. The longer of the two sides is considered its width. The side perpendicular to length and width is considered the depth of the box. 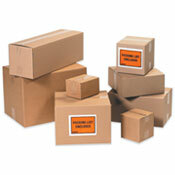 See our selection of Loose Fill, Bubble Products, Corrugated Rolls, and Air Cushions. Additionally, don't forget your Packing List Envelopes. 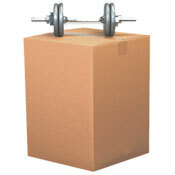 Some packers use a large box to pack many smaller items. However, even though the combined weight of the items may be within the limits of the box’s strength rating, this practice can make the carton excessively heavy and difficult to handle. 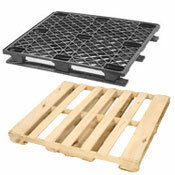 Our cartons are available in regular-slotted, half-slotted, and full telescoping styles. All cartons are made from corrugated fiberboard, which is recyclable. The cartons can also be made in single wall or double wall. 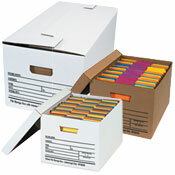 Cartons are available in 200-lb., 275-lb. and 300-lb. test, as well as the newer Edge Crush Equivalents (ECT).